Lance Carrera Newton #1 at the bowl serie. Venice AM 2011. The sun was there, the AM were there, the tricks were there, Jeff Stern was there and finally, the Venice AM Series 2011 results are there!!!!! 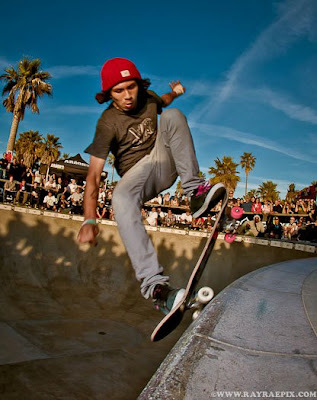 VENICE AM SERIES were today, Saturday, March 5TH at the Polar Bear skatepark of VENICE BEACH. $45 to enter one zone, $10 for each additional zone entered. Invitation Only! Looking for the best up and coming AM skaters. The Field is limited to approx. (75) skaters and there was CASH PRIZES!!! Sponsors: Metro PCS, Vitamin Water, Pro Tec, O’Quinn Clothing. Special thank you to the VSA (Venice Skateboard Association) for all your support. Check The National Skateboard Associations web site for more pics and results! Also check Ray Rae website for more pictures of the contest and of Venice skatepark.